Be the first to share your favorite memory, photo or story of Moulton. This memorial page is dedicated for family, friends and future generations to celebrate the life of their loved one. 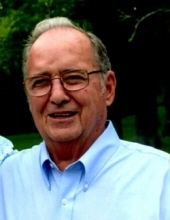 ELKHART - Moulton D. Dowell, 82, passed away at 2:35 a.m. on February 4, 2018 at Memorial Medical Center in Springfield. Moulton was born on September 26, 1935 in Menard County, IL; son of Rube and Hazel (Pierce) Dowell. He married Twila Altig on July 29, 1962 in Greenview, IL. She survives him. Also surviving is his daughter: Amy (Jeff) Edwards of Ballwin, MO; three grandchildren: Olivia, Cole, and Jackson all of Ballwin, MO; his siblings: James "J.E.” (Joyce) Dowell of Colorado Springs, CO, Marcella Edwards of Springfield, IL, twin brother Bob G. (Betty) Dowell of Springfield, IL, and Robbie Dowell of Athens, IL; many nieces and nephews. He was preceded in death by his parents, two sisters: JoAnn Plummer and Lillian Kirby, and infant brother: Raymond. Moulton attended Elkhart Christian Church, was a member of Elkhart American Legion, and was the Hurlbut Township Commissioner. He enjoyed spending time with his family and above all else he had a huge personality and loved joking with people. He also enjoyed gardening and collecting toy tractors. By many he will be remembered for his infectious smile. He retired from Fiat Allis after 40 years, and he worked for the Illinois Secretary of State. Services for Moulton will be 10:00 a.m. Friday February 9, 2018 at Elkhart Christian Church with Stacy Popejoy officiating. Visitation will be from 4:00-7:00 p.m. at Fricke-Calvert-Schrader Funeral Home in Lincoln, IL. Burial at Elmwood Cemetery in Greenview will follow the service, where full military rites will be accorded. Memorials may be made to the Elkhart American Legion or Simmons Cancer Institute or Elkhart Christian Church. "Email Address" would like to share the life celebration of Moulton D. Dowell. Click on the "link" to go to share a favorite memory or leave a condolence message for the family.